A global risk is defined as an occurrence that causes significant negative impact for several countries and industries over a time frame of up to 10 years. A key characteristic of global risks is their potential systemic nature – they have the potential to affect an entire system, as opposed to individual parts and components – as defined in Box 1.1 below. Box 1.1: What Is Systemic Risk? Note: 1 Kaufman, G. G. and K. E. Scott. 2003. “What Is Systemic Risk, and Do Bank Regulators Retard or Contribute to It?” Independent Review 7 (3): 371–391. See quote on p. 371. Source: Goldin, I. and M. Mariathasan. The Butterfly Defect: How globalization creates systemic risk, and what to do about it. Princeton University Press. Forthcoming Spring 2014. This report considers a core set of 31 global risks in five categories (see Table 1.1): economic, environmental, geopolitical, technological, and societal (Appendix A provides the definitions of individual risks). Risks in the economic category include fiscal and liquidity crises, failure of a major financial mechanism or institution, oil-price shocks, chronic unemployment and failure of physical infrastructure on which economic activity depends. Risks in the environmental category include both natural disasters, such as earthquakes and geomagnetic storms, and man-made risks such as collapsing ecosystems, freshwater shortages, nuclear accidents and failure to mitigate or adapt to climate change. The geopolitical category covers the areas of politics, diplomacy, conflict, crime and global governance. These risks range from terrorism, disputes over resources and war to governance being undermined by corruption, organized crime and illicit trade. The societal category captures risks related to social stability – such as severe income disparities, food crises and dysfunctional cities – and public health, such as pandemics, antibiotic-resistant bacteria and the rising burden of chronic disease. The technological category covers major risks related to the growing centrality of information and communication technologies to individuals, businesses and governments. These include cyber attacks, infrastructure disruptions and data loss. The core set of global risks considered in this report is not exhaustive, and the Forum attempts to continually refine it as the global risks landscape evolves. The list also includes “vulnerabilities”, or those trends that are already manifest and that affect other risks – for example, an ageing population represents a vulnerability potentially affecting a country’s fiscal situation. This distinction is further explored in Part 3 of this report. Since 2009, the Global Risks report has evaluated risks over a 10-year time horizon through the Global Risks Perception Survey, which gathers the perceptions of the World Economic Forum’s multistakeholder communities across different areas of expertise, geographies and age groups. It includes representatives of the World Economic Forum’s Member and Partner companies,1 members of the Network of Global Agenda Councils,2 Global Shapers3 and Young Global Leaders.4 Conducted in October and November 2013, this year’s survey gathered input from over 700 members of this community. Appendix B lays out a detailed description of the survey sample and methodology. 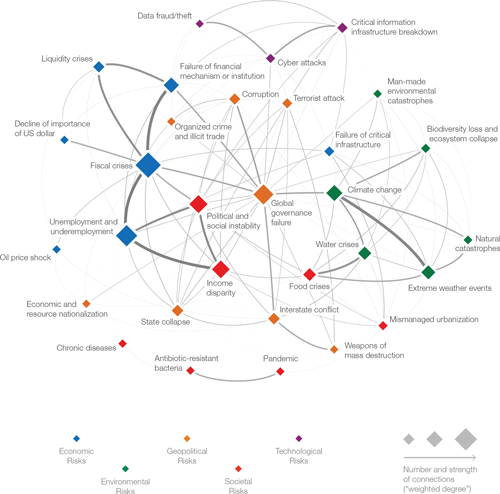 the Global Risk 2014 Interconnections Map, which shows the interdependencies between all risks, providing an understanding of the systemic consequences of global risks. Economic, societal and environmental risks dominate the list of global risks that the respondents are most concerned about, with fiscal crises emerging as the top issue (Table 1.2). Source: Global Risks Perception Survey 2013-2014. Note: From a list of 31 risks, survey respondents were asked to identify the five they are most concerned about. Despite the efforts of many eurozone countries to control their deficit and debt levels, concerns regarding fiscal crises persist. They are also fuelled by the high levels of public debt in Japan and the US, where political gridlock has exacerbated perceptions. Fiscal crises can severely affect the stability of the global economy, as explored further in Box 1.2. 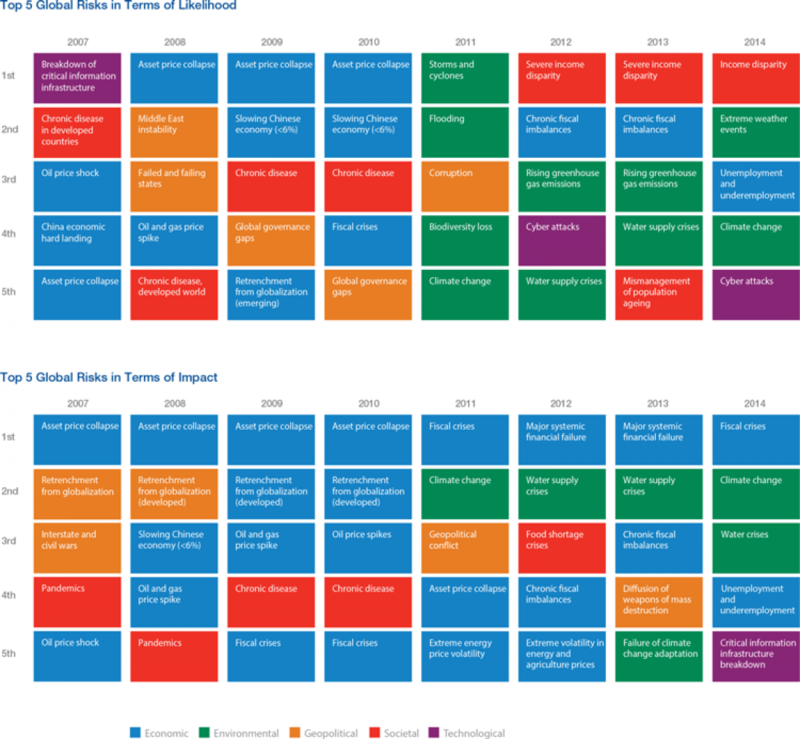 The risk of fiscal crises features as the top risk in this year’s Global Risks report. Governments often run deficits, spending more than they raise in taxes. They make up the shortfall by selling bonds – borrowing money from private investors with the promise of repaying it, with interest, at a specified future date. A fiscal crisis occurs when investors begin to doubt the government’s future ability to repay; the government then has to offer higher interest on its bonds to compensate investors for the increased risk. A vicious cycle starts: ballooning interest payments add to government debt, increasing the doubts of investors and forcing interest rates up still further. This can rapidly turn into a fatal spiral, in which fears that a country will default on its debt become a self-fulfilling prophecy. As government bonds tend to be held in substantial part by domestic banks, when the government defaults, the resulting losses on these bonds endanger banks’ solvency. In this way, a fiscal crisis can lead to financial crisis. The causation can also run the other way: the government may be forced to bail out large banks at risk of default to avoid a systemic financial crisis. However, the additional debt taken on can plunge the government from an already-precarious fiscal position into a full-blown fiscal crisis. Unsustainable debt developments ultimately force governments to undertake painful fiscal adjustments by cutting expenditures and/or raising taxes. If such austerity is not timed well, it can trigger a deep recession and a strong increase in unemployment, a dynamic which has played out in many advanced economies since the financial crisis of 2007-2008. By contrast, most emerging markets were able to quickly recover from the recent financial crisis. Latin American and Asian countries, which had experienced their own fiscal crises in the 1980s and 1990s, had implemented reforms to bring government debt under control. When they were hit by the fallout of the financial crisis, they had the fiscal leeway to stimulate economic activity through the opposite of austerity – increasing spending and/or cutting taxes. Advanced economies remain in danger of fiscal crises. Given the US’s official public debt of more than 100% of its GDP, and Japan’s of more than 230%, investors may at some point conclude that these levels are unsustainable. In the short run, the risks are higher for eurozone countries, which lack the option of devaluing their currencies to ease the necessary fiscal adjustment. Although ostensibly in a better position, many emerging markets have seen credit bubbles in recent years that could turn into financial crises, and then fiscal crises, for example, the rapid credit growth in Asia since 2008.1 A fiscal crisis in any major economy could easily have cascading global impacts. Finding ways to deal effectively with the current risks of fiscal crises is, therefore, important. Making fiscal frameworks more resilient in the future is even more important given the substantial longer-run fiscal challenges created by an ageing population. Structural unemployment and underemployment appears second overall, as many people in both advanced and emerging economies struggle to find jobs. The youth and minorities are especially vulnerable. Youth unemployment rates hover around 50% in some countries (such as Greece, Spain, South Africa). Closely associated in terms of societal risk, income disparity is also among the most worrying of issues. It raises concerns about the Great Recession and the squeezing effect it had on the middle classes in developed economies, while globalization has brought about a polarization of incomes in emerging and developing economies. This is true despite the obvious progress in countries such as Brazil and lower levels of poverty in several developing countries in Asia and Africa. Water crises and extreme weather events have been identified by the World Economic Forum community as two of the top 10 global risks. This is hardly surprising, given the devastating impacts of having too little water, or too much. While water’s immediate impacts are often local, water security is now recognized as a systemic global risk. In 2010, floods in Pakistan paralysed large parts of the country for many weeks, killing thousands of people and wrecking the rural economy. Thailand’s slow-onset flood in 2011 caused fewer deaths but showed how one local event could have an impact across the world: global car production slowed as supplies of components were cut, and hard-drive manufacture for the world’s computers was slashed. Similarly, Japan’s GDP and global industrial production dipped significantly following the tsunami of March 2011. Too little water can also have systemic impacts. Drought in Russia in 2010 led to restrictions on agricultural exports, causing the price of staple grains to rise across North Africa and the Middle East. The resulting food shortages and price rises aggravated the tensions that led to the Arab Spring. Some studies suggest that water scarcity could reduce grain production by as much as 30%. In the future, geopolitical tensions over access to strategic water resources could become more systemically impactful, and water shortage coupled with poverty and societal instability could weaken intra-state cohesion. Because of the systemic importance of water for global economic activity, any failings in its planning, management and use in one country can ripple across the world. That management is becoming increasingly complex and difficult as populations expand and people grow wealthier, demanding more freshwater to supply cities and factories and consuming more foods, such as dairy and meat, that need more water to produce. Water is equally key for energy production. While the world population grew fourfold in the 20th century, freshwater withdrawals grew nine times. While there is growing concern about future climate change exacerbating water-related risk, many countries cannot even manage today’s climate variability. Drought and flood could increasingly ravage the economies of poorer countries, locking them more deeply into cycles of poverty. Beyond water quantity, water quality is another critical issue. Pollution incidents have paralysed business operations in parts of China and elsewhere, disrupting global value chains and damaging corporate reputations – poor water quality or shortages are often blamed on business operations even when businesses comply fully with regulatory requirements. How can the global community respond? The overarching prescription is for a package of investments in information, institutions and infrastructure. But successful water management needs the cooperation of a wide network of water users, public and private institutions. The year 2014 is likely to be crucial for addressing climate risks, a point made by United Nations (UN) climate chief Christiana Figueres at the Warsaw Climate Change Conference. Countries made only limited progress on issues such as emissions reduction, loss and damage compensation, and adaptation. Greater progress is urgently needed to create incentives and mechanisms to finance action against climate change while efforts are made to keep temperature rise below 2 degrees Celsius. Given that global risks can be addressed effectively only through international collaboration, it is hardly a surprise that global governance failure is also included in the list as the risk of seventh highest concern. Figure 1.1 plots the aggregated survey responses on the perceived likelihood and impact of the 31 risks. The risks are grouped in four quadrants as delineated by the averages of their overall likelihood and impact. As evident, most risks cluster around the two upper quadrants, which identify risks with high impact. Source: Global Risks Perception Survey 2013-2014. Note: Survey respondents were asked to assess the likelihood and impact of the individual risks on a scale of 1 to 7, 1 representing a risk that is not likely to happen or have impact, and 7 a risk very likely to occur and with massive and devastating impacts. See Appendix B for more details. To ensure legibility, the names of the global risks are abbreviated. Please see Appendix A for the full name and description. 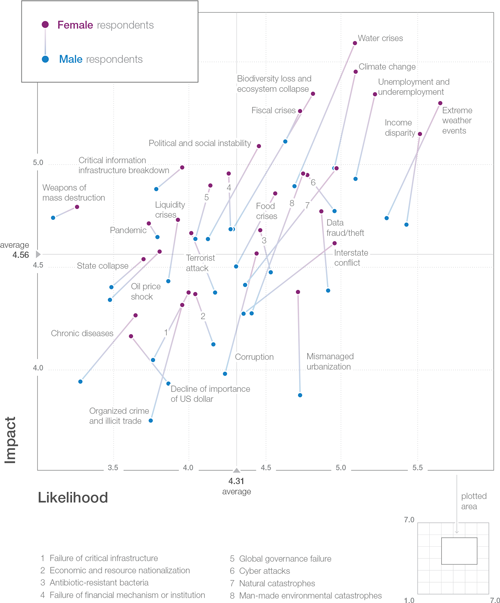 The upper right quadrant shows those global risks that are perceived by the respondents as both potentially impactful and likely to occur. 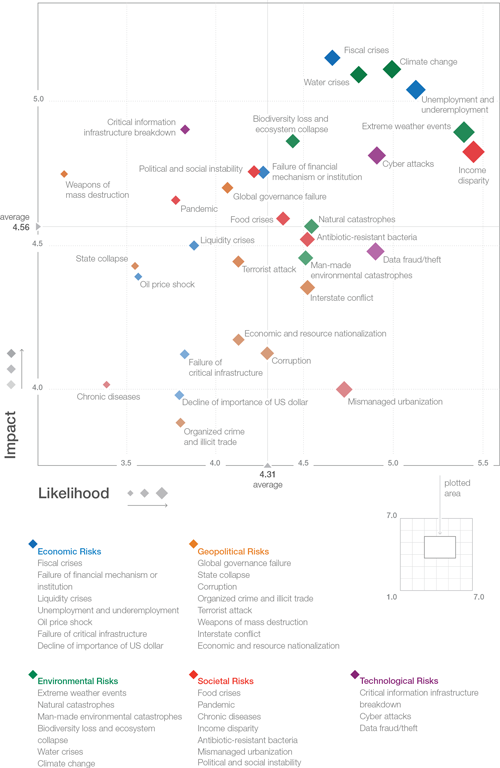 Similar to the risks of highest concern, this quadrant is dominated by economic, social and environmental risks. Fiscal crises and structural unemployment and underemployment are among the most impactful risks; the latter also feature among those most likely to occur, with knock-on effects on income disparities, which is regarded as the overall most likely risk. 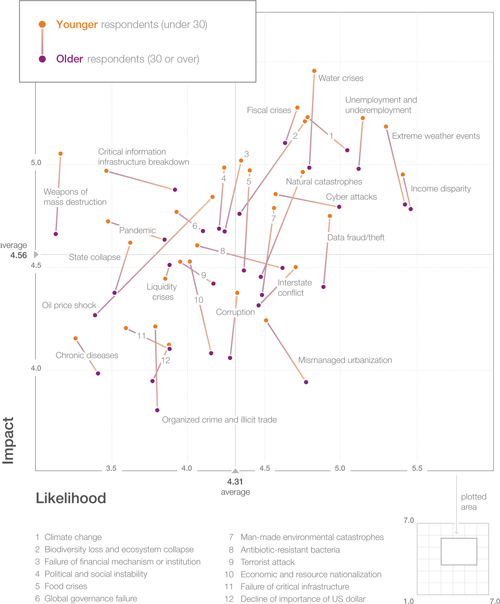 Climate change features among the five most likely and most impactful risks. Among other environmental risks, extreme weather events are considered the second most likely, and water crises also appear high on the list. This suggests a pressing need for better public information about the potential consequences of environmental threats, given that collective action will need to be based on common understanding. The upper left quadrant shows those risks that are considered less likely to happen, but would be impactful if they did. The deployment of weapons of mass destruction is perceived to be high-impact yet the least likely of the 31 risks, despite recent developments such as North Korea’s alleged third nuclear test and the deployment of chemical weapons in Syria. Other lower-likelihood, high-impact risks are the political collapse of a nation of geopolitical importance, an oil-price shock and the inability to deal with pandemics. Complementing Figure 1.1, the five risks considered most likely and most impactful since 2007 are shown in Table 1.3. Although the set of risks and their definitions have been continually revised over the years, the comparison still provides some qualitative insight into how global risk perceptions have evolved. Source: Global Risks reports 2007-2014, World Economic Forum. Note: Global risks may not be strictly comparable across years, as definitions and the set of global risks have been revised with new issues having emerged on the 10-year horizon. For example, cyber attacks, income disparity and unemployment entered the set of global risks in 2012. Some global risks were reclassified: water supply crises and income disparity were reclassified as environmental and societal risks, respectively, in 2014.
geopolitical risks, such as global governance failure, has given way to concern about socio-economic risks such as income disparity, unemployment and fiscal crises. In addition to the socio-economic and environmental risks, cyber attacks and the breakdown of critical information infrastructure are prominent risks. This arguably reflects the increasing digitization of economies and societies, where rising dependence on information and data, as well as the systems to analyse and use them, has made attacks more likely and their effects more impactful. It is also possible to isolate the perspective of young respondents, those aged under 30 years. In general, the younger generation is more concerned about the potential impact of global risks, while perceptions of likelihood show no such consistent deviation. Note: To ensure legibility, the names of the global risks are abbreviated. Please see Appendix A for the full name and description. Younger respondents were also more concerned than their older counterparts about the impact of the failure of a major financial institution, unemployment and political and social instability, which fits with the mindset of the “Generation Lost”, explored in Part 2.3. While the 31 risks have been separated out for analytical purposes, the numerous and complex interconnections between them can create consequences that are disproportionate and difficult to contain or predict. The Global Risks Interconnections Map (Figure 1.4) seeks to connect the dots by identifying and visualizing the underlying patterns. This allows for a better understanding of the impact of systemic risks so as to mitigate them by identifying the transmission channels between risks and potential second-and third-order effects. Note: Survey respondents were asked to identify between three and six pairs of global risks they believe to be most interconnected. See Appendix B for more details. To ensure legibility, the names of the global risks are abbreviated. Please see Appendix A for the full name and description. These interconnections do not represent direct causality. They are likely to be indirect, for example through parallel impacts or mitigation trade-offs. The Global Risks Interconnections Map shows how all global risks are connected to others and underlines the complexity of dealing with global risk in an effective manner. The map visualizes the strength of connection between individual risks – the most strongly connected risks could merit additional attention due to the multiple ways they affect or are affected by other risks. Respondents viewed global governance failure as one of the risks most connected to others. A well-functioning system could contribute to preventing and mitigating the consequences of global risks, which by definition require internationally-coordinated responses. The need for an agile and responsive multilateral governance system that can identify, forecast and respond to the multiple and interconnected risks of today’s globalized world is explored in Part 2.2 of this report, with particular reference to economic and geopolitical risks. Macroeconomic risks were strongly linked by respondents to various socio-economic issues. Failure of a financial mechanism or institution, fiscal crises and liquidity crises are risks closely interrelated among themselves and also with the risks of high levels of unemployment and underemployment, income disparity and political and social instability. Recent examples illustrate the reality of these interconnections – the failure of financial institutions brought about a financial crisis that resulted in liquidity crises affecting multiple national economies. This in turn led to higher levels of unemployment, widened income disparity and associated political and social tensions and protests, notably in some European countries and large emerging markets. Part 2.3 of this report examines these interconnections through the lens of the challenges facing today’s youth. The damage to economic assets, such as city and industrial infrastructure, agriculture and key global supply chains, caused by such extreme weather events is becoming more evident, as is the fragility of the global logistics and mobility systems (see Box 1.5). Consequently, “resilience” has become a key policy and agency theme to counteract the growing sense of economic, political and social risk that changing climatic conditions pose. More than half of the world’s population now lives in cities. By 2050, the urban population will have nearly doubled to an estimated 6.4 billion. Most of the increase in urban populations will be in middle- and lower-income countries, which have more limited capacity to manage the new risks being created – and existing risks being exacerbated – by the global urban transition. While urbanization provides important economic and social gains, it substantially increases risks related to ecological disruptions, pollution, climate change and environmental disasters. Populations are agglomerating along coastal areas where climate change portends rising sea levels, extreme weather events, earthquakes and tsunamis. Urban flooding has already become the leading form of disaster in the world, and the UN forecasts that the number of people in large cities exposed to cyclonic winds, earthquakes and flooding will more than double in the first half of this century. Around 1 billion people, one-third of the world’s urban population, live in slums1 – a number that has been increasing in the current era of high and widening income inequalities. This growing population of urban poor is vulnerable to rising food prices and economic crises, posing significant risks of chronic social instability. Communicable diseases can spread more quickly in densely-populated areas, increasing the risk of global pandemics. For example, if a new strain of avian flu were to spread globally through the air travel network that connects the world’s major cities, 3 billion people could potentially be exposed to the virus within a short span of time. More generally, cities are connected systemically through physical and informational networks in ways that may become apparent only when events in one location are rapidly transmitted globally in unexpected trajectories. For example, the 2011 earthquake in Japan and subsequent nuclear power plant meltdown had cascading impacts through global supply chains that immediately led to decreases in auto production around the world. As urban populations grow, multistakeholder processes of inclusive governance will increasingly be needed to make cities resilient against these complex and interconnected risks. While cities have been efficient at driving change in some areas, substantial improvements in urban governance capacities will be needed to address risks, especially in the emerging economies where future urbanization will mostly take place, and which are especially vulnerable to systemic risks. Source: For more information, see Douglass, M. 2013. The Urban Transition of Environmental Disaster Governance in Asia. Working Paper Series No. 210. Singapore: Asia Research Institute. Available at http://www.ari.nus.edu.sg/publication_details.asp?pubtypeid=WP&pubid=2334. The risk of global governance failure, which lies at the heart of the risk map, is linked to the risk of climate change. Negotiations on climate change mitigation and adaptation are progressing by fits and starts, perpetually challenged to deliver a global legal framework. Meanwhile, a regime of national, regional and public-private collaborative efforts to address the problem is gathering pace. This may represent the future of global governance – a more intricate lattice of multiple, interconnected government agreements related to relatively simple global “goals” (such as a commitment to limit warming to no more than 2 degrees Celsius), supported by a framework of collaborative alliances and partnerships to help deliver on that target across different themes, regions or sectors. Arguably, such a heterogeneous and diverse intergovernmental and public-private response to the climate-change risk could offer more resilience and flexibility to the dynamic challenge of climate change than a homogenous, single global framework. The technological risks of cyber attacks, data fraud/theft and critical information infrastructure breakdown are strongly connected to each other and to risks such as terrorist attacks and global governance failure. This reflects the changing nature of vulnerability in an increasingly digitized world, and the need for global multistakeholder collaboration to maintain the resilience of cyberspace. These issues are explored in Part 2.4 of this report. Adopting a proactive, precautionary approach to anticipating future challenges can help to avoid being caught by surprise and forced into a fully reactive mode. A range of assessment methodologies can be applied to identifying and understanding emerging risks. In this year’s report, respondents to the survey were asked to identify additional global risks that are already or could become relevant and were not explicitly surveyed. 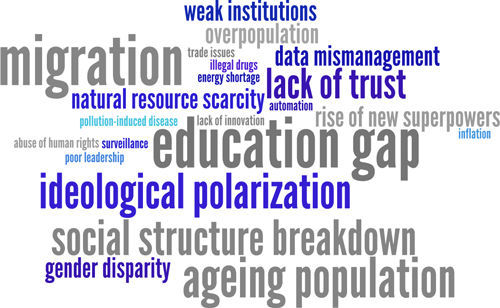 Figure 1.5 shows categories of issues that respondents mentioned most frequently. Gathered into three broad categories, the most commonly identified issues are presented here, followed by additional assessments and comments from experts. Demographic trends have been flagged, including the risk of being unable to deal with rapid population growth and the growing burden of an ageing population – which could also be a source of great opportunities for society and business if managed effectively. Concerns were also raised about unmanaged migration flows, overpopulation and energy crises. Societal concerns include the breakdown of social structures, the decline of trust in institutions, the lack of leadership and persisting gender inequalities. Risks related to ideological polarization, extremism – in particular those of a religious or political nature – and intra-state conflicts such as civil wars, were also frequently highlighted. Several concerns in this category relate to the future of the youth: the quality of and access to education, the marginalization of young generations and high rates of youth unemployment (see Part 2.3 for more on this topic). Technological concerns include data mismanagement, loss of privacy, increase in surveillance, and possible abuse of new and more complex information technology, which is further explored in Part 2.4. These risks are becoming potentially more impactful as social media transitioned from a purely social pastime into the corporate communications environment. Another environmental trend to track is the development and production of unconventional oil and natural gas resources, such as oil sands and shales, which require processes and technologies (e.g. fracking) that differ considerably from those used for conventional resources in terms of energy input, cost and environmental impact.15 Their impact and sustainability are being increasingly questioned. Appreciation is growing that high historical rates of economic progress, especially those experienced by emerging markets, may not be sustainable in the future. Environmental pressures that could undermine competitiveness include pollution, biodiversity loss and climate change, while scarcity of mineral resources could endanger future consumption as demand continues to climb. The implications of water shortages, for example, are explored in Box 1.3. Social tensions could also undermine competitiveness, as people fear that economic growth may not translate into the desired results for society in terms of inclusion, equity and cohesion. Although it is clear that these systemic risks can undermine economic competitiveness, the magnitude of their capacity to do so and their complex interactions are not well understood. Building on its Global Competitiveness Index (GCI), the World Economic Forum is working on a sustainability-adjusted GCI that captures the extent to which prosperity is being generated in a sustainable way, taking into account environmental stewardship and social sustainability.1 The findings suggest that there is no necessary trade-off between being economically competitive and being sustainable. Many countries at the top of the competitiveness ranking are also the best performers in terms of sustainability measures – for instance, Switzerland, Finland, Germany, Sweden and the Netherlands. The sustainability-adjusted GCI can be seen as capturing a country’s preparedness to face many of the systemic global risks explored in this report. Among the core factors it measures are environmental degradation, strength of governance, provision of health and education, and macroeconomic stability – all factors that influence how sustainable a country’s economic competitiveness is, and how resilient it is to risk. Understanding the relationship between sustainability and competitiveness is crucial to understanding how to mitigate and build resilience to global risks. Note: 1 For more information on the sustainability-adjusted Global Competitiveness Index, see Chapter 1.2 of The Global Competitiveness Report 2013-2014, World Economic Forum 2013. Natural disasters could conceivably trigger existential risks in combination with new technologies – a possibility suggested by the March 2011 tsunami that caused a meltdown at the Fukushima nuclear power plant in Japan. There is also the theoretical potential for “error or terror” in emerging sciences, such as nanotechnology or synthetic biology; within a few decades, for example, it may become as feasible to create real viruses in a home laboratory as it now is to create computer viruses on a home computer. Among other existential risks is the possibility that breakthroughs in artificial intelligence could move rapidly in unexpected directions; the spread of antibiotic-resistant bacteria could dramatically set back modern medicine; solar super-storms could devastate vital information and communications technology networks; climate change could tip into a self-reinforcing, runaway phase of rising temperatures; a meteorite could hit a densely-populated area or an asteroid could strike the earth. Although these threats sound forbidding, there are ways to prevent most of them, or at least to mitigate their impacts. While research and innovation can provide new approaches, established institutions can also play an important role. For example, in October 2013 the UN General Assembly approved the creation of an International Asteroid Warning Group. It is important for the public and private sectors to work together to address existential risks. The private sector has experience and expertise to offer in the realms of strategic planning, organizational design, institutional adaptation, research, scientific investigation and technological innovation. However, effective public-private collaboration will require vision, strategy and commitment to more extensive, consistent and systematic approaches at the country, regional and international levels. This, in turn, requires an appreciation that existential risks exist not only in the realms of science fiction but also in reality. Note: 1 Existential risks as defined by Nick Bostrom of Oxford University. Economic, societal and environmental concerns continue to dominate the global risks landscape in the minds of leaders around the globe, with the threat of fiscal crises in key economies topping the list. The results emphasize the interconnectedness of all the global risks analysed in this chapter, underscoring the need for effective global governance and a better understanding of causes and consequences to be able to prepare for, mitigate and strengthen resilience to these risks. Global risks can only be effectively dealt with if there is a common understanding of their importance and interconnected nature, and a readiness to engage in multistakeholder dialogue and action. The effectiveness of such an approach was demonstrated when a protectionist response to the 2008 crisis was contained through a joint effort by multilateral institutions, the private sector and the G20. This report offers a framework for decision-makers to look at risks in a holistic manner and to stimulate discussions on ways to address global risks more effectively. Bowman, A. 2013. “HSBC: Asia’s ‘worrying’ debt-led growth.” Financial Times, February 21. Available at http://blogs.ft.com/beyond-brics/2013/02/21/ hsbc-asias-worrying-debt-driven-growth/#axzz2mhjDelCh. Coates, J. M. and J. Herbert. 2007. “Endogenous steroids and financial risk taking on a London trading floor.” Proceedings of the National Academy of Sciences 105 (16):6167-72. CRO Forum. 2012. Endocrine Disruptors: Risk Management Options. Emerging Risk Initiative – Position Paper. Available at http://www.thecroforum.org/ endocrine-disruptors/. Douglass, M. 2013. The Urban Transition of Environmental Disaster Governance in Asia. Working Paper Series No. 210. Singapore: Asia Research Institute. Available at http://www.ari.nus.edu.sg/publication_details. asp?pubtypeid=WP&pubid=2334. Eckel, C. C. and P. J. Grossman. 2008. “Men, women and risk aversion: Experimental evidence.” Handbook of experimental economics results 1:1061-1073. European Commission. 2005. Synthetic Biology: Applying Engineering to Biology. Report of a NEST High-Level Expert Group. Brussels: The European Commission. Available at http://www.bsse.ethz.ch/bpl/publications/nestreport. pdf. Goldin, I. and M. Mariathasan. The Butterfly Defect: How globalization creates systemic risk, and what to do about it. Princeton University Press. Forthcoming Spring 2014. Hong, L. and S. E. Page. 2001. “Problem Solving by Heterogeneous Agents.” Journal of Economic Theory 97 (1):123-163.
International Energy Agency (IEA). 2013. World Energy Outlook 2013. Paris: IEA. International Monetary Fund (IMF). 2013. World Economic Outlook. IMF Survey Magazine. Available at http://www.imf.org/external/pubs/ft/survey/so/2013/ RES040913B.htm. Kaufman, G. G. and K. E. Scott. 2003. “What Is Systemic Risk, and Do Bank Regulators Retard or Contribute to It?” Independent Review 7 (3): 371–391. Lehnert, T., D. Sonntag, A. Konnopka, S. Riedel-Heller, and HH. König. 2013. “Economic costs of overweight and obesity.” Best Practice & Research. Clinical Endocrinology & Metabolism 27 (2):105-115. McKinsey Global Institute. 2013. “QE and ultra-low interest rates: Distributional effects and risks”. Available at: http://www.mckinsey.com/insights/economic_ studies/qe_and_ultra_low_interest_rates_distributional_effects_and_risks. Scherr, S. J., J. C. Milder, L. E. Buck, A. K. Hart, and S. A. Shames. 2013. A vision for Agriculture Green Growth in the Southern Agricultural Growth Corridor of Tanzania (SAGCOT): Overview. Dar es Salaam: SAGCOT Centre. Available at http://www.ecoagriculture.org/documents/files/doc_483.pdf. United Nations Environment Programme (UNEP). 2011. UNEP Year Book 2011: Emerging Issues in our Global Environment. Nairobi: United Nations Environment Programme. Available at http://www.unep.org/yearbook/2011/. Van Liere, K. D. and R. E. Dunlap. 1980. “The Social Bases of Environmental Concern: A Review of Hypotheses, Explanations and Empirical Evidence.” The Public Opinion Quarterly 44 (2): 181-197. Werrell, C., F. Femia, and A-M. Slaughter. 2013. The Arab Spring and Climate Change – A Climate and Security Correlations Series. The Center for American Progress, The Stimson Center, and The Center for Climate and Security. Available at: http://climateandsecurity.files.wordpress.com/2012/04/climatechangearabspring-ccs-cap-stimson.pdf. World Bank. 2010. Economics of Adaptation to Climate Change: Synthesis Report, Washington DC: World Bank. Available at http://climatechange. worldbank.org/sites/default/files/documents/EACCSynthesisReport.pdf. World Economic Forum. 2013. The Global Competitiveness Report 2013-2014. Geneva: World Economic Forum. Available at http://www3.weforum.org/docs/ WEF_GlobalCompetitivenessReport_2013-14.pdf. 5 An independent evaluation to be carried out by the European Central Bank in major European banks should provide a more detailed assessment of the situation. 6 According to the US Department of Agriculture, the US experienced its most severe and extensive drought in 25 years in 2012, with some 80% of all US agricultural land experiencing drought. This in turn caused around US$ 40 billion in lost crops and livestock, according to the National Climatic Data Center, and spikes in commodity prices such as corn, which peaked at US$ 7.63 a bushel – more than one dollar over its high of 2011. 7 For example, while there is no doubt a number of reasons caused the devastating civil war, recent research is unearthing the hidden role that climate change, extreme weather events and a water crisis also played in Syria. Between 2006 and 2011, up to 60% of Syria’s land experienced one of the worst long-term droughts in modern history. Together with the mismanagement of water resources, this drought led to total crop failure for 75% of farmers, forcing their migration and increasing tensions in urban cities that were already experiencing economic insecurity and instability. (Werrell et al. 2013): Between 2006 and 2011, up to 60% of Syria’s land experienced one of the worst long-term droughts in modern history (Werrell et al. 2013). 9 See, for example, Van Liere and Dunlap 1980. 10 See, for example, Hong and Page 2001 and Coates and Herbert 2007. 11 See, for example, Van Liere and Dunlap 1980. 12 The risk multiplier that climate change presents to water shortages, biodiversity loss, ocean damage and deforestation also creates a complex “heterarchy”, rather than a simple hierarchy, of environmental risks, often with non-linear patterns of change and self-fuelling feedback mechanisms. This heterarchy is not contained within IPCC models, but could encompass the greatest economic risk of all from climate change. 14 For a recent in-depth risk assessment on endocrine disruptors, see CRO Forum 2012. 15 See IEA 2013 and http://www.nytimes.com/2013/03/14/opinion/global/ the-facts-on-fracking.html?pagewanted=1&_r=0. 16 See, for example, European Commission 2005. 18 McKinsey Global Institute 2013. 19 See, for example, http://www.theguardian.com/technology/2013/nov/18/ bitcoin-risks-rewards-senate-hearing-virtual-currency; and http://www.forbes. com/sites/timworstall/2013/05/29/bitcoins-in-danger-from-the-bureaucracy/. 20 See, for example, http://ec.europa.eu/economy_finance/structural_reforms/ ageing/index_en.htm. 21 Lehnert et al. 2013.